Cinque Terre and Porto Venere, Italy | Travel? Yes Please! On the Ligurian coast of Italy, you’ll find five colourful seaside villages, nestled along a jagged coastline and surrounded by terraced vineyards. Known as Cinque Terre, or “five lands”, the villages of Monterosso al Mare, Vernazza, Corniglia, Manarola and Riomaggiore make up one of the most scenic regions of Italy. Cinque Terre and Porto Venere, along with the islands of Palmaria, Tino and Tinetto, were designated as a World Heritage Site in 1997. They are a fantastic example of how people have been able to transform the environment without altering the beauty of the landscape. When I visited Porto Venere and Cinque Terre, I was on a two week coach tour of Italy. After visiting Pisa in the morning, we drove through La Spezia, where we would be spending the night, and on to Porto Venere. After exploring Porto Venere for about an hour, we took a very cold ferry ride to Cinque Terre. I marvelled at the pretty pastel villages tucked in between steep, rocky hills. I absolutely loved how colourful the buildings were! In Canada, most houses are varying shades of beige…pretty boring and lacking personality. 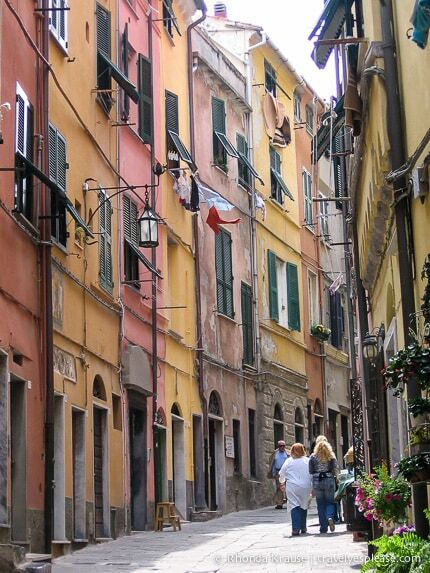 Love this street in Porto Venere! I would have loved to visit all five villages, but we were only able to see two. We got off the ferry at the fourth village, Vernazza and the fifth village, Monterosso. After a bit of walking around, we took the train back to La Spezia. Here are a few highlights of my visit to Porto Venere and Cinque Terre. Built by the Romans, Portus Venerus, as it was then known, dates back to at least the middle of the first century. During Roman times it was a small fishing community. After the fall of the Western Roman Empire, Porto Venere was used by the Byzantine Navy as a base and later became part of the Republic of Genoa in 1113. Overlooking the historic centre of Porto Venere are the ruins of Doria Castle. Built by the Genoese in 1161 for the very wealthy and influential Doria family, the castle remnants give a glimpse into their lavish life and also offers stunning views. From the castle, you will notice the Gothic Church of St. Peter, standing on a rocky promontory. It was built in 1198 over a 5th century Palaeo-Christian Church. The black and white bands of marble are the newer part of the church, built in the the 13th century. Vernazza, a picturesque fishing village, is the fourth town heading north. Vernazza was founded in 1000 and became part of the Republic of Genoa in 1276. Vernazza was integral in Genoa’s conquest of Liguria, helping out by providing port, fleet, and soldiers. Vernazza is surrounded by steeply terraced olive groves which produce some of the finest olive oil in Italy. Fishing, wine and olive oil production still take place even though tourism has become Vernazza’s main source of revenue. Vernazza’s main sights are Piazza Marconi and the octagonal bell tower of the Church of Santa Margherita d’Antiochia (both seen in the photos above and below). The earliest reference to the Church of Santa Margherita d’Antiochia was in 1318, but some scholars believe it was built earlier in the 12th century. The church is unique in that its entry way is east-facing. Monterosso is divided into two parts, the old town and the new town, connected by a short tunnel. Monterosso has one of Cinque Terre’s few beaches, complete with beachside restaurants and cafes. Other notable sights are the Church of St. John and its bell-tower, built in 1244, the ruins of the old castle, and a 17th century Capuchin monastery. The area is famous for its lemon trees and limoncino, a lemon liqueur made from Monterosso lemons. I would have loved to had more time in Cinque Terre. I know I say that a lot about places I visit while on a tour, but it is true- there is never enough time! I would like to go back so that I can hike the coastline trails between the villages, especially Via dell’Amore (Lover’s Lane) and enjoy the scenery from above. The Cinque Terre villages are well connected by rail and each has a train station. Regular local trains from Genoa and La Spezia run with high frequency. All trains are operated by the state carrier, Trenitalia. Cars are not allowed beyond village entrances in Cinque Terre, so it’s best to take the train from La Spezia to save yourself a hefty parking fee and strenuous hike. A more scenic option is to take the boats that run up and down the coast. Since Cinque Terre is prone to landslides, sometimes the hiking trails are closed for safety reasons. Check with park officials before heading out. You must purchase a pass to hike the trails. Passes are available at the information offices near the train stations in all of the five villages. It’s also possible to purchase a combination hiking and train pass if you wish to catch a train to the next town. In La Spezia you can purchase an all day train pass that also allows you to hike the Cinque Terre trails. Porto Venere is served by bus from La Spezia (a 12 km ride). From late March to November, Navigazione Golfo dei Poeti sails from Porto Venere to Cinque Terre. For your convenience, here is a list of hotels in La Spezia, Porto Venere, Vernazza, Monterosso al Mare, Corniglia, Manarola and Riomaggiore. Please consider booking your Cinque Terre accommodations through the included link. It costs nothing extra and helps support this website. Thank you!